According to a new report from Ad Age, Samsung Electronics beats consumer goods giant Procter & Gamble (P&G) to emerge as the world’s largest advertiser in 2017. 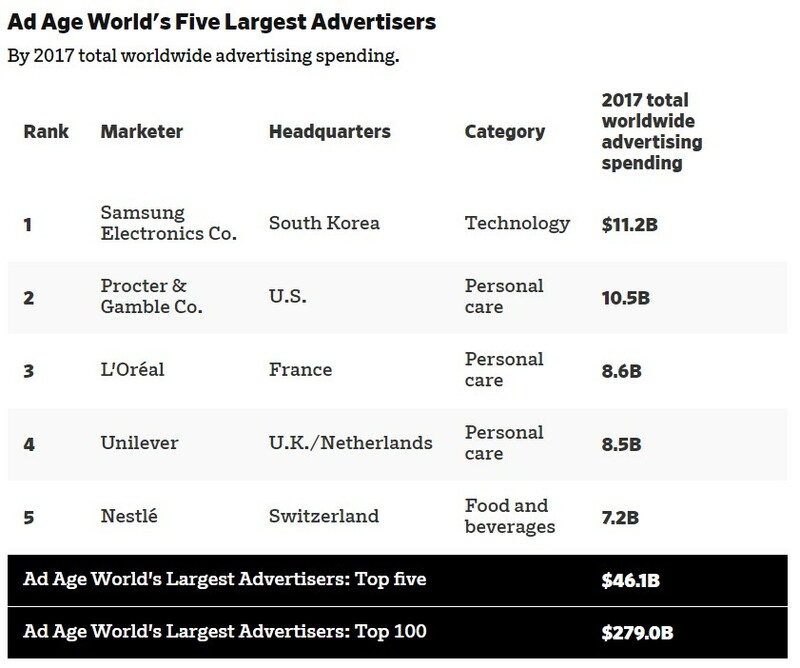 The rankings which are based on reported and estimated spending by companies on various forms of advertising, including sales promotions, placed Samsung’s spending at a whopping $11.2 billion last year, ahead of P&G’s estimated $10.5 billion in the year ended June 2018. Samsung’s ad spending went up by 13% year-on-year, while P&G didn’t see much of a change compared to the previous year. Though there is no evidence of a direct correlation, the report observes that Samsung’s marketing costs increased as the company tried to put behind the Galaxy Note 7 disaster. Interestingly, the report says P&G is still the largest advertiser in the world when you consider a “narrower definition of advertising.” The consumer goods company spent a reported $7.1 billion on TV, print, radio, internet, and in-store ads, while Samsung spent $4.8 billion on the same. This excludes Samsung’s “massive sales promotion budget” (freebies, discounts, contests, etc.) which is what catapulted the South Korean company to the top of the rankings. Though Samsung Electronics continues to post record earnings in the recent quarters, most of it is driven by the stellar performance of the company’s semiconductor business, which doesn’t need or rely on huge ad spending. Consumer products like smartphones, tablets, television, PCs, etc. which require massive marketing costs haven’t been performing as well as Samsung would have wanted. Due to increasing market saturation and competition from Chinese brands, smartphones sales, in particular, has turned out to be a major concern for Samsung. The company has already undertaken many measures to counter the slump in sales, but the results are far from satisfactory so far. A recent report stated that the company is now reviewing the performance of the PR agency looking after its mobile business in its latest attempt to turn around the smartphone business.